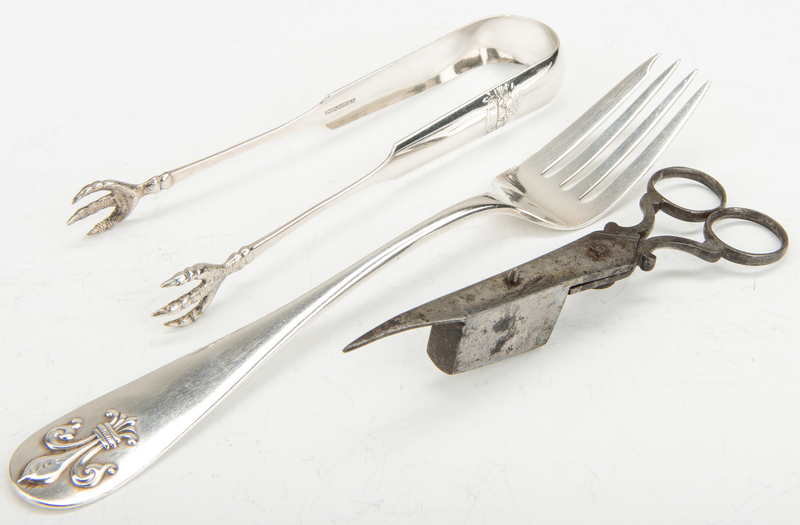 15 silver items related to the family of U.S. Chief Justice John Marshall. 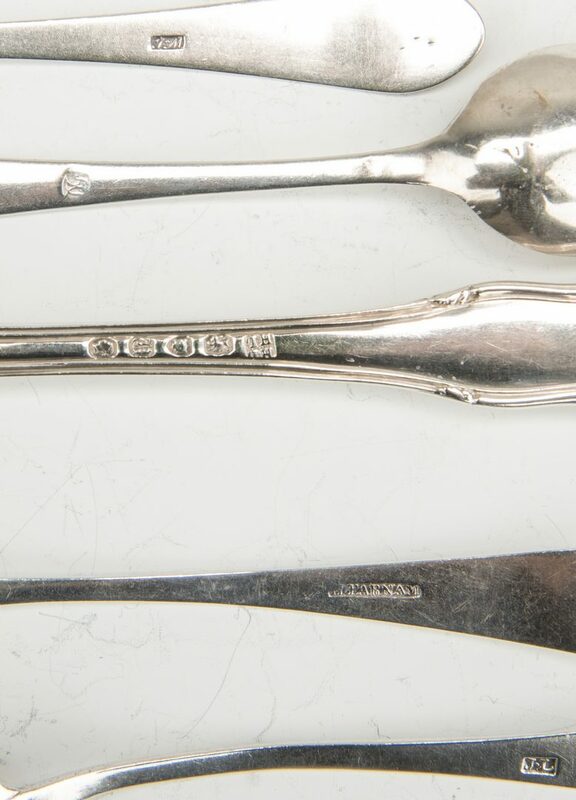 1st group: One Durgin sterling silver cold meat fork, W. Senter & Co. retailer, with applied fleur de lys on tip and script monogram en verso, "JWB" for Julia Wingate Boyd, 8-5/8" L; 1 English sterling tablespoon with swell and shell tip, marks for Henry and Henry John Lias, London, 1855, interlocking script monogram "A", possibly for Adams, 8-1/8" L: 4.765 oz troy (2 items). 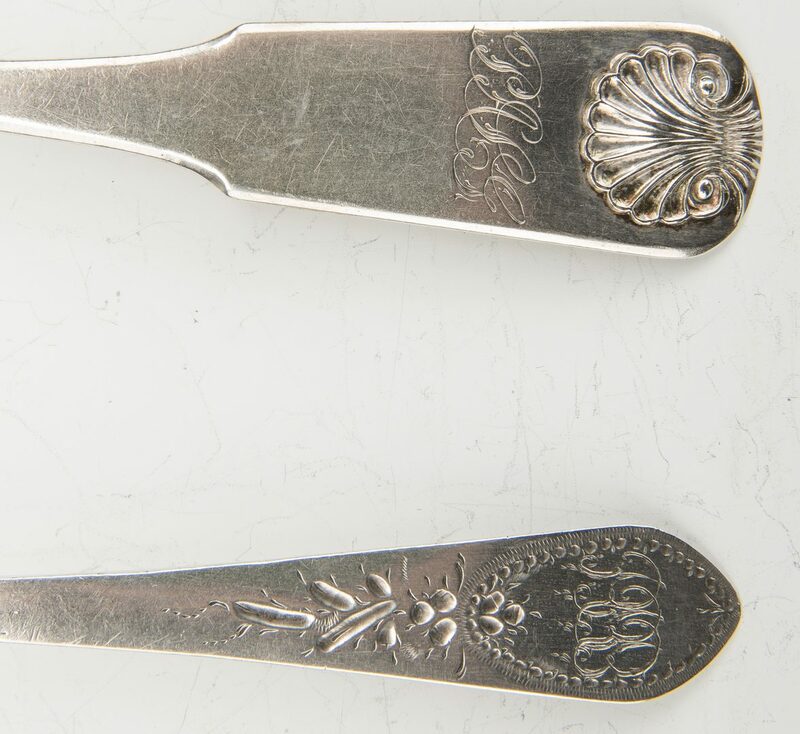 2nd group: 13 coin silver flatware items by various makers including 1 teaspoon, marks for John Lamson (Boston and Baltimore, 1816-1818), script monogram "B" for Boyd; 2 teaspoons with coffin tipts, marks for H. Farnam, Boston, "HG" in script on ends; 2 teaspoons with rounded tips, impressed maker's marks "W+L" in rectangle, script monogram " JG" on tipt; 1 teaspoon with rounded tip and bright cut decoration, maker's mark worn, script monogram "RB" on tipt; 1 sugar tongs, marks for J.B. Jones, Boston, with bird claw handle ends and impressed fruit basket decoration, "CH" script monogram at end, 6-1/4" L; pair tablespoons, pseudo hallmarks flower, eagle, flower en verso, shell decoration on tips, script monogram "PASG" on tipt possibly for Pamela Augusta Gilman (1802-1880); pair tablespoons with bright cut decoration on tips, "DG in oval" maker's mark en verso, script monogram "RBB" on tip; 1 tablespoon with coffin tipt, "F.W" in rectangle maker's mark, script monogram "H" on tip; 1 tablespoon with coffin tipt, H. Farnam, Boston, maker's mark, script monogram "HG" on tipt and Old English monogram "C.H.B.". 5-1/2" to 9-1/4" L., 15.605 oz t./13 coin silver items. 4.765 oz t/2 sterling items. Provenance: The Estate of Charles Boyd Coleman, Jr., Chattanooga, TN. Both items descended in the family of Annette Maria Dearborn Boyd, daughter of Greenleaf Dearborn (1786-1846) and great granddaughter of General Henry Dearborn (1751-1829) on the side of her mother, Pamela Augusta Gilman (1802-1880). Annette was married to Charles Harrod Boyd and had four children, including Julia Wingate Boyd (wife of Lewis M. Coleman, Jr.). Lewis M. Coleman, Jr. was the son of CSA Lt. Colonel Lewis M. Coleman and Mary Ambler Marshall, granddaughter of John Marshall (1755-1835), fourth Chief Justice of the United States and Secretary of State under John Adams (1800-1801). CONDITION: All items in overall very good condition. 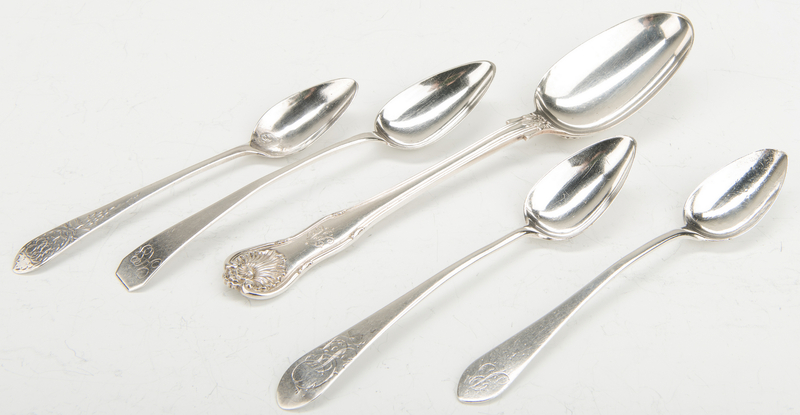 One tablespoon and one teaspoon with dent or possible repair in bowl near handle.